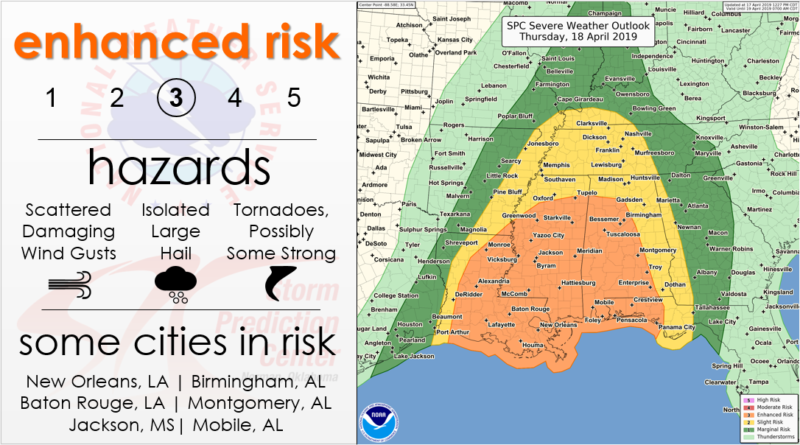 of severe weather will be possible, with the highest threat for tornadoes in the “Enhanced Risk” area (3 out of 5), which also could see a few long track, strong Tornadoes. Surrounding the “Enhanced Risk” area is a large “Slight Risk” area (2 out of 5). The main threat in the “Slight Risk” area should be damaging winds, but an isolated Tornado or two will be possible. States effected tomorrow will be Alabama, Mississippi, Louisiana, Tennessee, Georgia, and Kentucky. mph or higher and rainfall of 1-2 inches, with locally higher amounts up to 3 inches. There is a low risk for tornadoes, but a few are possible across North Alabama tomorrow evening/night. 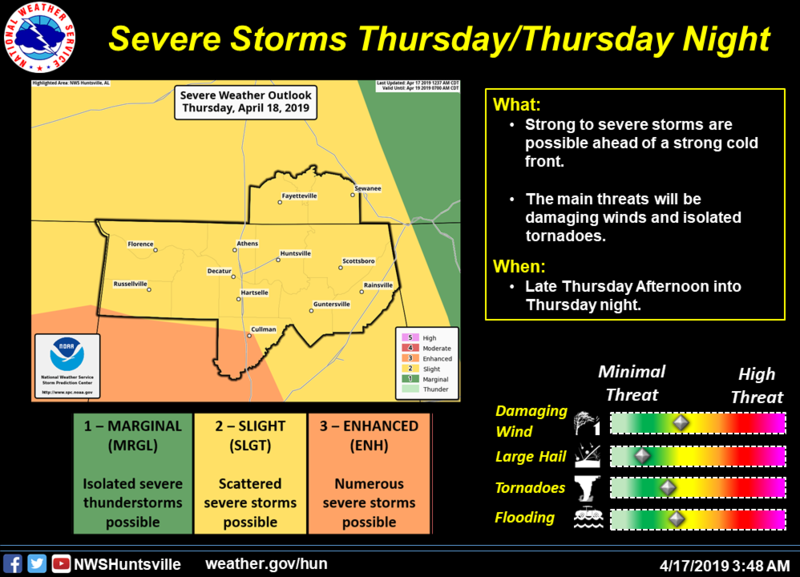 The system has slowed down a little and the current track should put the severe weather window in the North Alabama area between 4 PM and midnight on Thursday. Be sure to remain weather alert of Thursday evening and night. This is the current information from the NWS and the SPC. Look for updates tomorrow morning for the latest changes. Here’s the latest forecast for severe weather across parts of the Southeast for tomorrow (Thursday): Severe thunderstorms capable of tornadoes and extensive wind damage will be possible across parts of Louisiana, Mississippi, and Alabama. 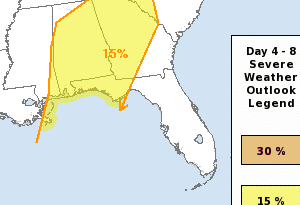 Scattered severe storms are also possible as far east as the Florida Panhandle, and as far north as western Tennessee. Some of the tornadoes could be strong. If you live in these areas, now is the time to prepare. Make sure you have more than one way to receive severe weather watches and warnings, and be sure to follow your local National Weather Service Forecast Office for additional information.